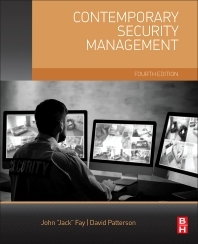 Contemporary Security Management, Fourth Edition, identifies and condenses into clear language the principal functions and responsibilities for security professionals in supervisory and managerial positions. Managers will learn to understand the mission of the corporate security department and how the mission intersects with the missions of other departments. The book assists managers with the critical interactions they will have with decision makers at all levels of an organization, keeping them aware of the many corporate rules, business laws, and protocols of the industry in which the corporation operates. Coverage includes the latest trends in ethics, interviewing, liability, and security-related standards. The book provides concise information on understanding budgeting, acquisition of capital equipment, employee performance rating, delegated authority, project management, counseling, and hiring. Productivity, protection of corporate assets, and monitoring of contract services and guard force operations are also detailed, as well as how to build quality relationships with leaders of external organizations, such as police, fire and emergency response agencies, and the Department of Homeland Security.